All India Management Association (AIMA) is an association of more than 60 managements was setup in 1957 for the promotion of management profession. The AIMA is also member of SAAMO and AAMO. The main motivation of AIMA is to provide young and dynamic professionals to the country. With that motivation AIMA also conducting Under graduate aptitude test i.e. UGAT 2018. The AIMA UGAT 2018 is an entrance test for those candidates who want to take admission into various under graduate programs such as BBA, BCA, BHM, Integrated MBA (IMBA) etc. With the help of AIMA UGAT 2018 score card candidates will take admission into UG and Integrated PG degree courses from aima recognized institutes. Near about 62 professional institutes across India will accept the AIMA UGAT score card 2018 and they give admission. AIMA UGAT Eligibility 2018: If you want to participate into AIMA UGAT test then first you have to check their UGAT Eligibility criteria 2018. As we know that the UGAT test for UG and integrated PG course then you should have 10+2 certificate or similar certificate from recognized board or University. AIMA UGAT Syllabus 2018; AIMA UGAT Exam Structure 2018: As we know that the AIMA UGAT is an aptitude test then UGAT exam board asked English Language, Numerical and Data Analysis, Reasoning and Intelligence and General Knowledge for IMBA, BBA, BCA courses and for BHM the subjects are English Language, Numerical and Data Analysis, Reasoning and Intelligence, General Knowledge, Service Aptitude and Scientific Aptitude. Last Dates AIMA UGAT Application form 2018 is May 2018. AIMA UGAT Results 2018: After the AIMA UGAT exam all candidates eager to download AIMA UGAT results. With the help of form number and date of birth you will get AIMA UGAT results. AIMA UGAT Counseling 2018: After disclosing the AIMA UGAT result all qualified candidates very eager to participate into AIMA UGAT counseling process. Before participation into AIMA UGAT counseling all qualified candidates required to register online for UGAT counseling 2018. 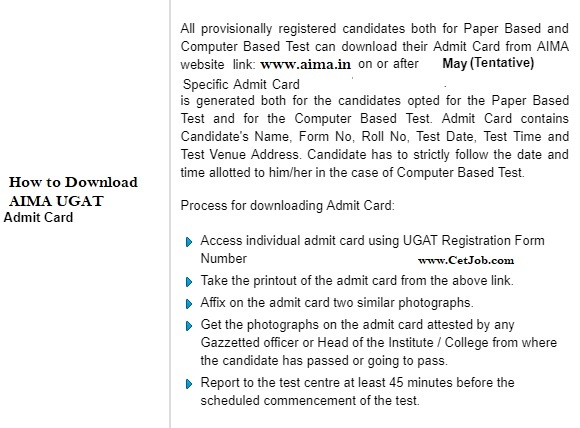 · Purchase the UGAT Bulletin with the Registration Form against cash payment of 500/- from listed Institutes or from AIMA, Lodhi Road New Delhi. · Register online at website link; https://apps.aima.in/Ugat2018with Credit Card or Debit Card (ATM Card) payment of 500/-. Detailed procedure is given on the website link. · Register online at website link: https://apps.aima.in/Ugat2018by making payment of 500/- through Net Banking. Detailed Procedure is given at the website link. Register online at website link; https://apps.aima.in/Ugat2018along with a Demand Draft of 500/- in favour of ‘All India Management Association’ payable at Delhi. Detailed procedure is given on the website link. Four Digit codes for Management Institutes/University Departments accepting the UGAT Score are given in the List of Participating Institutes/Universities as MI Code. There are five fields given in the Registration Form. Select the codes of those five institutes only where you are applying for admission. No additional fee is to be paid for filling these 5 choices. Important Notice: Applicants are advised to check the approval/recognition status of various programs and other details directly from the concerned Authorities/ Institutes/ Universities. 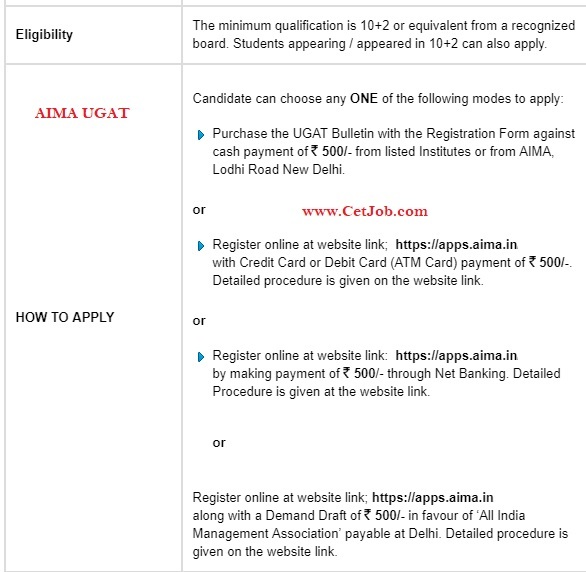 AIMA HAS COME ACROSS A COUPLE OF CASES WHERE THE ASPIRING CANDIDATES' UGAT SCORE IS NOT ACCEPTED BY SOME PARTICIPATING INSTITUTES/UNIVERSITIES FOR ADMISSION TO UNDER GRADUATE FULL TIME COURSE DESPITE THEIR CONFIRMATION TO AIMA AT THE TIME OF PARTICIPATION BY INCORPORATING THEIR NOTIFICATIONS IN UGAT BULLETIN. CANDIDATES ARE ADVISED TO RECHECK WITH THE CONCERNED INSTITUTES/UNIVERSITIES BEFORE APPLYING FOR UGAT. · Test Centre City list is provided in the Bulletin. Also, the list of cities is provided in the drop down menu for the Test Centre Choices in the Registration Form. Test Venues for Paper-Based Test and Computer Based Test are different. · The Computer-Based Test will take place in Delhi NCR only. · The Paper-Based Test and Computer-Based Test will take place on the same date and same time, i.e., on 12 May 2018 (Saturday) (Tentative) between 1000-1300Hrs. All filled-in forms or printout of online registration if required to be sent; received at AIMA will be processed within 5 days and the Form Numbers of such received forms will be available on website link: http://apps.aima.in/ugat2018/receiptstatus.aspx. Such forms will be scrutinized and if found in order; it will be Provisionally registered. However, form printout received later than the due date is liable to be rejected. Neither any correspondence in this regard will be entertained nor the fee to be refunded. All provisionally registered candidates both for Paper Based and Computer Based Test can download their Admit Card from AIMA website link: (http://apps.aima.in/ugat2018/admitcard.aspx) on or after 05 May 2018 (Saturday) (Tentative). Specific Admit Card is generated both for the candidates opted for the Paper Based Test and for the Computer Based Test. Admit Card contains Candidate's Name, Form No, Roll No, Test Date, Test Time and Test Venue Address. Candidate has to strictly follow the date and time allotted to him/her in the case of Computer Based Test. · Take the printout of the admit card from the above link. · Affix on the admit card two similar photographs. · Get the photographs on the admit card attested by any Gazzetted officer or Head of the Institute / College from where the candidate has passed or going to pass. · Report to the test centre at least 45 minutes before the scheduled commencement of the test.